You are serious about training through for a marathon, you want a treadmill that will have no problem keeping up with your ever-changing needs and demands. There are a lot of outstanding options available on the market today, but there are a few reasons why we recommend the Sole Fitness F80 Folding Treadmill for nearly any buyer. The Sole Fitness F80 Folding Treadmill edges close to gym quality and will easily cater even ‘abusive’ treadmill runners. Out of excuses much? How Does the Sole Fitness F80 Work? 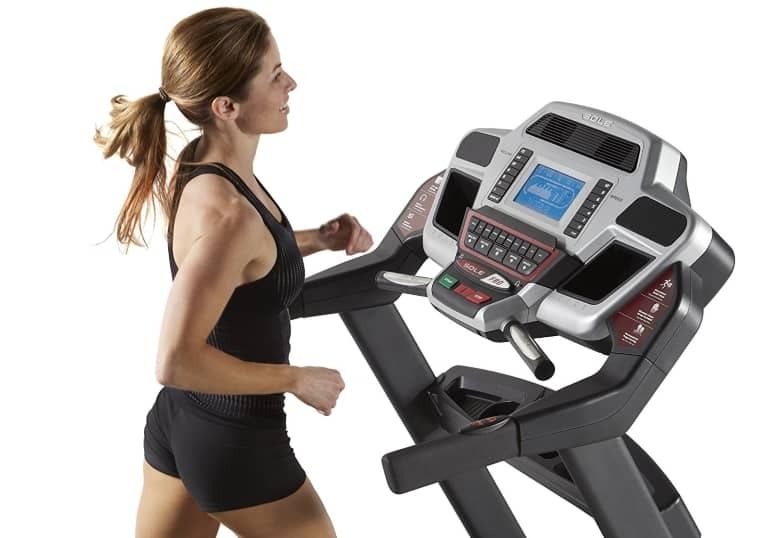 Whether you need to work on an incline to reduce strain put on your joints, or if you are a long distance runner who likes mixing things up with a series of sprints and elevation variations, this machine can accommodate your needs. The 3.5 CHP motor is powerful and can confidently handle speeds up to 12 mph. It also boasts all-steel, zinc-coated flywheels to ensure a vibration-free running surface. Speaking of the running surface, the treadbelt is 22″ x 60″, which is one of the largest you will find, especially in width. Plus, the belt is made of four layers, including rubber, PVC, and nylon to provide a static-free, smooth surface. It features a streamlined control console with a vibrant blue LCD screen. The Integrated Message Board delivers alphanumeric text regarding speed, pace, distance, calories burned, heart rate, and other valuable information, so you can monitor every second of your workout. What Are the Health Benefits of Using the Sole Fitness F80? The Sole Fitness F80 Folding Treadmill allows you to enjoy a safe and convenient workout any time you want. If you want to squeeze in a casual jog to wake you up in the morning, or burn some energy late at night, so you can sleep, you will be able to do so without leaving the house. There will never be any weather-related excuses, and you will not have to worry about risking injury due to uneven terrain or a slippery surface. Also, since it features a Cushion Flex Whisper Deck, it reduces impact on your joints by up to 40 percent. This unit also has six present programs to help you reach your fitness goals. Running is good for your cardiovascular system, muscles, bones, and mood. Plus, it helps you lose weight, which puts you at less risk for cancer, type 2 diabetes, heart disease, arthritis, and a long list of other medical conditions. Safety Lock Deck makes it easy to fold vertically and store out-of-the-way when not in use. Built-in speakers to listen to your iPod playlist, so you don’t have to wear earbuds. Cushion Flex Whisper Deck is quiet and absorbs impact, which reduces stress on your back and joints. Treadbelt is smooth, static-free, and spacious. Built-in fans are nice to have to cool you down during an intense workout. Lifetime warranty on frame, motor, and deck. Electronics are covered for five years; labor is covered for two years. You can look for this product at a local sporting goods store, but you will need a rather large vehicle and extra hands to haul it home and carry it in the house. You can search online retailers, as well. However, we recommend Amazon because the site is secure, shipping is fast, and dealing with customer service is always a rewarding experience. You can order directly from Amazon for only $1,499.99. This is $1,000 off retail price, and you get free shipping to your home. Also, you may be surprised that assembly is not nearly as challenging as you might expect. It is unfair to say there is anything actually “wrong” with this treadmill. It really is a great product. It just does not measure up to a few of our favorite picks. However, a 4-star rating from us is not easy to get, so this should tell you that this one really does deliver solid performance. Plus, it has one of the largest running surfaces you will find on the market, which may be exactly what you are looking for. For the price, it is lacking, when it comes to technology features. Also, even folded, this unit is a significant size, so make sure you have the space for it in your home. We have made it clear that there is a lot we like about this treadmill. However, to make an informed buying decision, it is always a good idea to read reviews by consumers just like you. If you head over to Amazon, you will find several honest opinions about this product.